Linux System is much secured than any of its counterpart. One of the way to implement security in Linux is the user management policy and user permission and normal users are not authorized to perform any system operations. 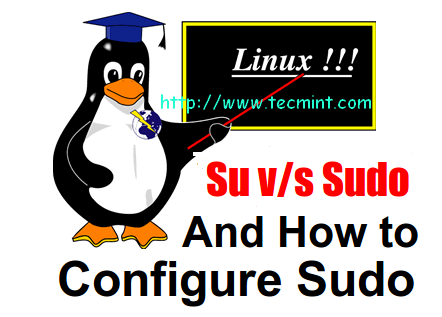 If a normal user needs to perform any system wide changes he needs to use either ‘su‘ or ‘sudo‘ command. NOTE – This article is more applicable to Ubuntu based distributions, but also applicable to most of the popular Linux distributions. ‘su‘ forces you to share your root password to other users whereas ‘sudo‘ makes it possible to execute system commands without root password. ‘sudo‘ lets you use your own password to execute system commands i.e., delegates system responsibility without root password. ‘sudo‘ is a root binary setuid, which executes root commands on behalf of authorized users and the users need to enter their own password to execute system command followed by ‘sudo‘. We can run ‘/usr/sbin/visudo‘ to add/remove the list of users who can execute ‘sudo‘. Note: You must be root to edit /usr/sbin/visudo file. In many situation, System Administrator, specially new to the field finds the string “root ALL=(ALL) ALL” as a template and grants unrestricted access to others which may be potentially very harmful. Editing ‘/usr/sbin/visudo’ file to something like the below pattern may really be very dangerous, unless you believe all the listed users completely. 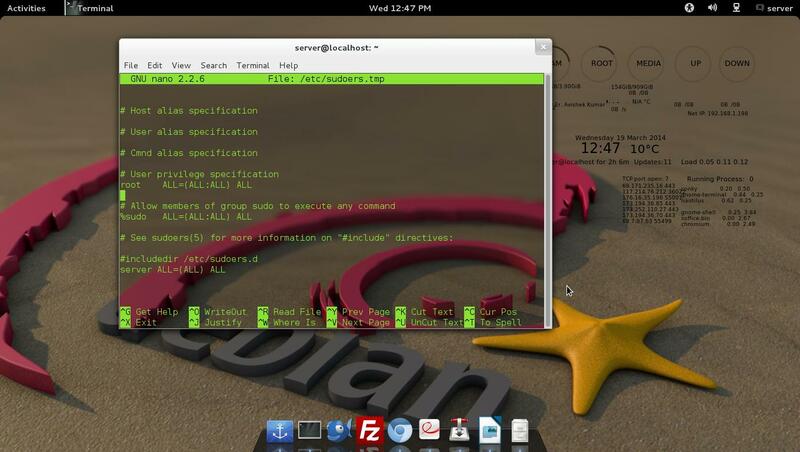 A properly configured ‘sudo‘ is very flexible and number of commands that needs to be run may be precisely configured. User_name: This is the name of ‘sudo‘ user. Machine_name: This is the host name, in which ‘sudo‘ command is valid. Useful when you have lots of host machines. (Effective_user): The ‘Effective user’ that are allowed to execute the commands. This column lets you allows users to execute System Commands. Command: command or a set of commands which user may run. Q1. You have a user mark which is a Database Administrator. You are supposed to provide him all the access on Database Server (beta.database_server.com) only, and not on any host. Q2. You have a user ‘tom‘ which is supposed to execute system command as user other than root on the same Database Server, above Explained. Q3. You have a sudo user ‘cat‘ which is supposed to run command ‘dog‘ only. Q4. What if the user needs to be granted several commands? If this list of command varies to the range, where it is literally not possible to type each command manually we need to use aliases. Aliases! Yeah the Linux utility where a long-lengthy command or a list of command can be referred as a small and easy keyword. A few alias Examples, which can be used in place of entry in ‘sudo‘ configuration file. Q5. How about executing a ‘sudo‘ command without entering password? We can execute a ‘sudo‘ command without entering password by using ‘NOPASSWD‘ flag. Here the user ‘adam‘ can execute all the commands aliased under “PROCS”, without entering password. “sudo” provides you a robust and safe environment with loads of flexibility as compared to ‘su‘. Moreover “sudo” configuration is easy. Some Linux distributions have “sudo” enabled by default while most of the distros of today needs you to enable it as a Security Measure. To add an user (bob) to sudo just run the below command as root. That’s all for now. I’ll be here again with another Interesting article. Till then stay tuned and connected to Tecmint. Don’t forget to provide us with your valuable feedback in our comment section. These comments are based on a multi user environment. In the case of shared computers of truly multi-user systems, sudo makes sense. However for single user systems and administrator use, su makes more sense for a variety of reasons including convenience and environment configuration. I do understand the confusion in this regard, especially with younger users, as Ubuntu started this confusion by misusing sudo to give it a more Windows like admin configuration model for individual admin tasks as it utterly lacks any unified administration interface where you’d give the root password once to enter and configure the system. So for example, as an administrator of my system, I keep a terminal shell open in which I’ve su’d to root and use that shell for all admin tasks. If I wanted to allow other users of the system to have access to network configuration or printer setup, I’d use sudo to allow access to those tools. I have a doubt in the below line. My understanding is ‘mark’ and ‘tom’ both are the sudo users, both users have same (ALL commands )access on beta.database_server.com machine. Is this correct? or any difference is there in between ‘mark’ and ‘tom’ users in terms of privileges on beta.database_server.com machine? Could you please explain more about Q2, i didn’t quite catch that. As per to the question, user tom which is supposed to execute system command as user other than root on the same database server. How can I get sudo to use the root aliases in /etc/bashrc? That’s not possible, either add aliases to sudo user .bash_profile file, or for global use add in /etc/profile file. I have two user accounts. let test1 and test2. How can I switch to test2 from test1 without prompting password. That’s not possible, because both are different users with different home directories, you must enter password to login to user account..
What if the password is not set for neither of the users? It still prompting for password and what we have to give?